If you have an additional day in hand then you can go for the day tour to Lonavala and take a look at the beautiful Karla Bhaja Caves. These are among the oldest Buddhist caves in India and date back all the way to 160 B.C. The drive to the hill station of Lonavala in just 2 hours. The drive is smooth and quick as your cars sails on the Mumbai-Pune four lane expressway. Both the caves have considerable climbing. The Karla Caves are very important for the Buddhists, but people from other religions are also very much interested in visiting these caves. The caves were built between 3rd and 2nd century BC and they served as an important trade route from the Arabian Sea to the Deccan areas. 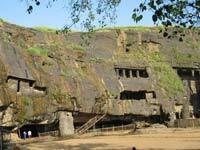 The popular Bhaja Caves are on the other side of Karla Caves. The rock cut caves date back to 200 BC and they share a similar style of architecture as the Karla Caves. The Baja Caves include 14 stupas out of which five stupas are inside the caves and the rest are outside. It is a delight to watch a small waterfall in the monsoon season culminating in a small pond. A must visit in Lonavala at a distance of 2 kms from the main market. The huge temple complex has beautiful idols of Goddess Narayani, Ganesh and Hanuman. The temple also has accommodation and sumptuous meal options. There is also a cow shed near the temple and a garden at the entrance where children can enjoy. The wax museum in Lonavala can be termed as a miniature version of Madame Tussauds Museum in London. You will lifelike wax models of Indian celebrities, actors, politicians and other artistes besides a few Hollywood actors. Recommended time to start for Lonavala Tour is between 7 am and 9 am.